Noah’s Ark Preschool is a mission of the Presbyterian United Church of Christ and was founded in 1991. It is licensed by the Department of Human Services (DHS) and is reviewed annually by DHS to ensure quality care and education. Noah’s Ark Preschool serves children ages 3-5 and adheres to objectives which are supported by the Iowa Early Learning Standards. At Noah’s Ark Preschool, each class has an age-appropriate schedule which encourages routine, and the curriculum focuses on skills necessary for kindergarten readiness. Examples of curricular areas include letter and number recognition, phonological awareness, colors and shapes recognition, self-care skills, conversation and sharing skills, and beginning math concepts. At Noah’s Ark Preschool, the children explore learning in various learning centers throughout the classroom as well as in large groups, small groups, and individually with the teacher. At Noah’s Ark Preschool, the teachers and members of the Presbyterian United Church of Christ want all children to have opportunities for success as they embark upon their educational journeys, so tuition assistance is available for qualifying families. 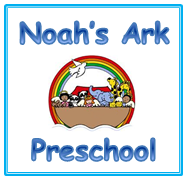 Noah’s Ark Preschool employs two staff members (the Director/Teacher and the Assistant Teacher), who are certified in CPR, First Aid, Mandatory Reporting, and Universal Precautions. They also complete at least 10 hours of continuing education each year. The preschool uses the services of Area Education Agency (AEA), DHS, Northwest Early Childhood Iowa (NECI), and Mid-Sioux Opportunity. To never be a substitute for parents but someone the child can count on for friendship, fairness, guidance, encouragement, love, and acceptance, no matter what the child’s behavior and developmental pattern. If you are interested in more information, please contact the preschool at (712) 546-6626 or email us at puccnoahsark@premieronline.net.